low calorie dals. low calorie kahdis. Low Cal Dals and Kadhis are protein rich accompaniments and form an integral part of Indian main meals. Each state has its own way of making dals using different combinations of spices and masalas. Like moving towards west, they predominantly use coriander powder and cumin seeds powder, and towards south there is abundance use of rasam powder or sambhar powder, while the north zone has garam masala as their secret masala. Here in this section you will find an array of dals from all these regions. These dals and kadhis are a good way to add many nutrients to our diet like. We have Hariyali Dal made with 1 tsp of oil. Then we have Dahiwala Toovar Dal made with Zero Oil and low fat curds. Dal Makhani is the most popular dal in Punjab and can be made with low fat milk and only 1 tsp of oil. Then we can have the Fatless Maa Ki Dal which does not use high fat butter. Have your low cal Rasam (only 59 calories per serving) with some Buckwheat Dosa (92 calories) to complete a super healthy Breakfast. We have also some low cal Green Chutney to accompany this. Kadhis also have no limits. Here are a few low calorie options you can rely on and add to your low cal diet without guilt. Try healthy low calorie kadhis like Subzi Kadhi which will boost your diet with fibre and low calorie vegetables lke cauliflower and French beans, Sprouts Kadhi is a great way to add protein in your menu, have it with your choice of phulkas or roti to increase the protein quality. Tamatar ki Kadhi is a nice tangy kadhi and is packed with an antioxidant lycopene which has many health benefits. 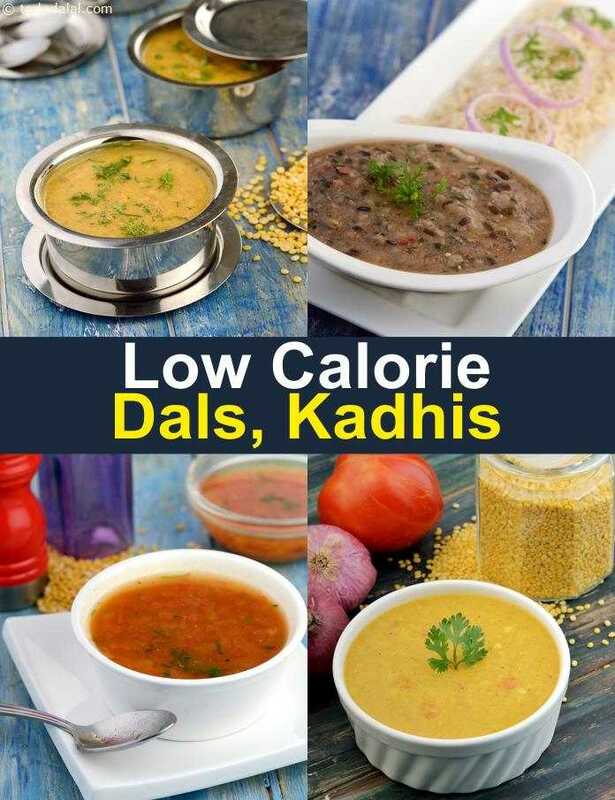 Enjoy these simple healthier low calories dals and kadhis a part of your meals for lunch or dinner and other low calorie articles below.